Looking for someone to help you transfer video tapes of your grandkids to DVD? Need to take your MiniDV video of your daughter's school show to DVD? 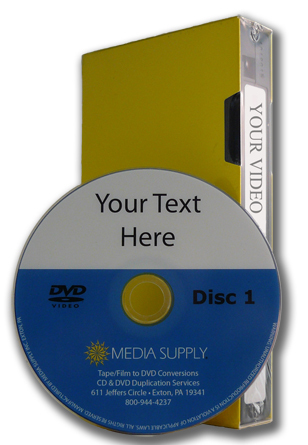 Media Supply now has complete services for transfer your video tapes to DVD Disc. Our professional Video Tape to DVD Conversion services can take all your old VHS, VHC-C, 8mm & MiniDVD tapes and convert them into professional quality DVD discs. Every one of these DVD discs features a customized digital print label and a menu for easy viewing. Media Supply can also convert your 8mm, Super8 & 16mm film to DVD. We even handle big jobs, so if you have a box of 40 old VHS tapes at home, bring them in! We offer simple drop off and pickup service if your in the Exton, Pennsylvania area. We can also accept tapes from all over the country. Just request a quote online or contact us at 800-944-4237 option 3 to set up a drop off or to let us know your sending in tapes via USPS, Fedex or UPS. Click here to request our Duplication Catalog.